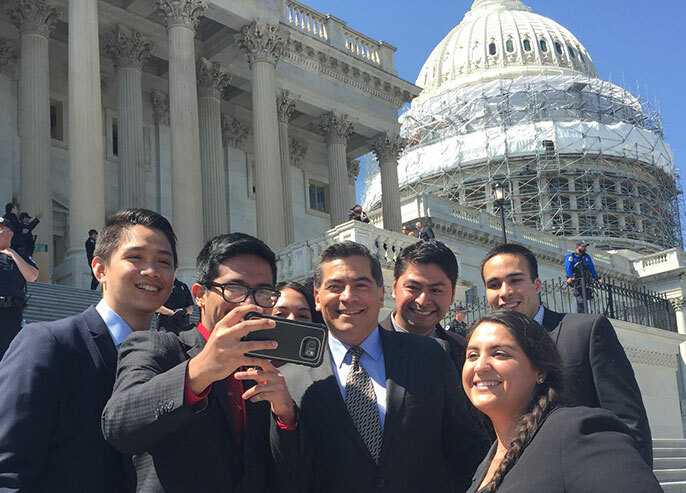 2016 Spring interns at the UC Washington Center take a photo with Congressman Xavier Becerra. Fellows are selected based on financial need and a demonstrated commitment to civic engagement and public service. Applicants must also have applied for an internship through the UC Washington Center or the UC Center Sacramento. Internships are open to all students, regardless of major, and include placements in a wide array of organizations. Students may work alongside elected officials, in state or federal agencies, with advocacy groups, scientific organizations, public relations firms or the news media. University of California President Janet Napolitano has awarded fellowships to 27 undergraduates from across the UC system who will participate in public service internships this coming fall in Washington, D.C., and Sacramento. Students from each of UC’s nine undergraduate campuses were selected for the Presidential Public Service Fellowships following a competitive application process. Fellows were selected based on a demonstrated commitment to civic engagement and public service. They will each receive a $2,500 stipend to offset incidental costs related to public service internships through the UC Washington Center (UCDC) or the UC Center Sacramento (UCCS). Napolitano, who was herself a Truman Scholar, created the Presidential Public Service Fellowship program in Feb. 2016 to spur student interest in public service careers, and to ensure that cost was not a barrier to student participation in federal or state internships. Most internship costs are covered through regular tuition and fees, but students often face incidental expenses, such as travel and the purchase of appropriate business attire. The public service fellowships offset those costs.